Article: Tech is not enough! While technology plays a crucial role in digital transformation, it is only an enabler. The real change happens when organizations make the internal shift and enable the creation of a culture that facilitates a growth mindset for employees for sustainable success. A look at why and how a growth mindset is the real spark that generates success for organizations. 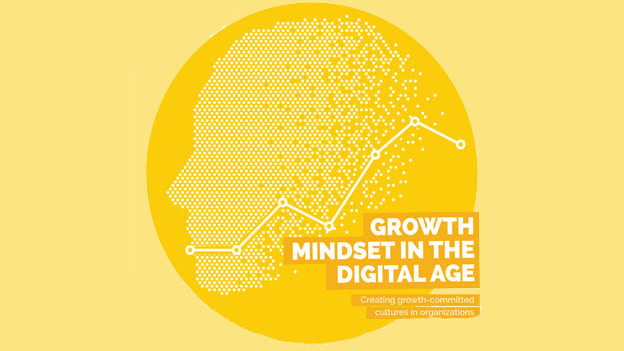 Prominence needs to be plunked on 'growing' the mindsets of people because, ultimately, everything comes down to the abilities of the humans to propel change whether that involves them to have a digital mindset or a growth mindset. A technology shift not supported by a cultural shift is a sure shot recipe for failure for any business initiative, which in turn necessitates organizations undertaking digital transformation to not only inspect and examine the adoption of technology but give equal importance to the work culture along with the mindsets and attitudes of their employees. It is about challenging people in a way they can learn and develop. With agility, collaboration, and innovation being imperatives for organizations in the digital age, the correlation between a growth mindset and positive behaviors in organizations signifies that a growth mindset is a critical factor that determines the success of organizations. And to enable this, organizations need to build cultures of development to attain the alignment of people with the organizational vision and also stronger and positive employee perspectives. For this cover story, we reached out to industry leaders and practitioners for their insights and perspectives on why a growth mindset is important for organizations and how organizations can build and foster a growth mindset culture of development. Fostering change acceptance is the first step of a growth mindset: Abhijeet Mukherjee, CEO, Monster.com, APAC, and Gulf.